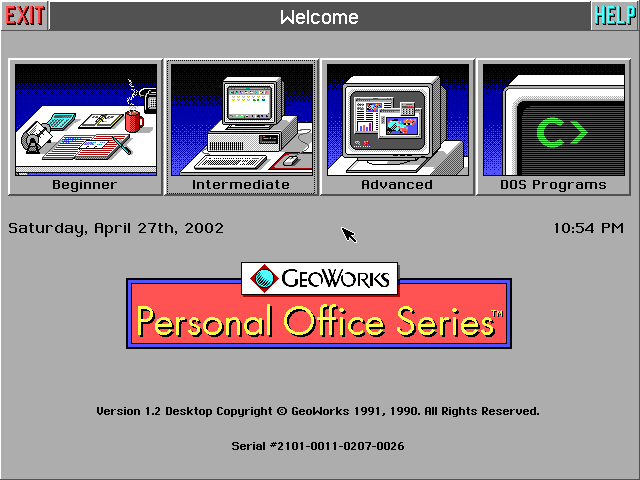 This is the GeoWorks welcome screen. GeoWorks is the desktop software that runs on top of the PC/GEOS operating system which runs on top of DOS. This is a very interesting user interface that differs from most because it actually has three different user interface modes each designed for a different level of user: Beginner, Intermediate and Advanced. The beginner mode starts off with a group of buttons listing all available application programs. Clicking on a button opens the application in full screen. "Exit" and "Help" buttons are located in the corners where they are easy to find and click on. There are no drop-down menus in the "Beginner" applications. The applications that produce documents always open to the same document each time and do not allow opening a different one. 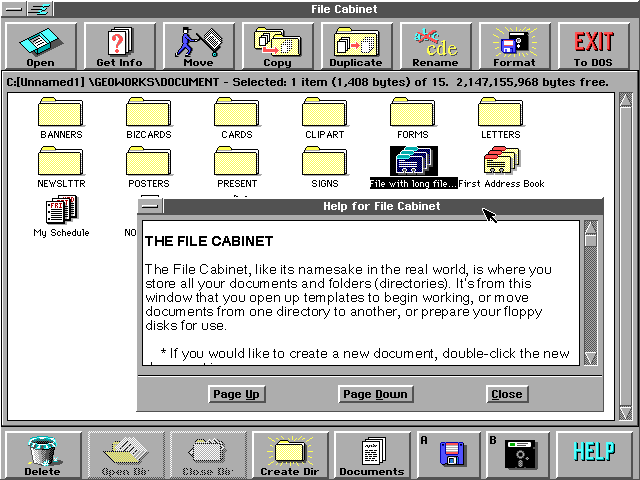 Intermediate mode starts off in the "File Cabinet" where files and folders are displayed as icons. Here you are presented with all of your GeoWorks documents, you can create new documents and manage your files. Unlike the beginner mode you can create multiple separate documents. 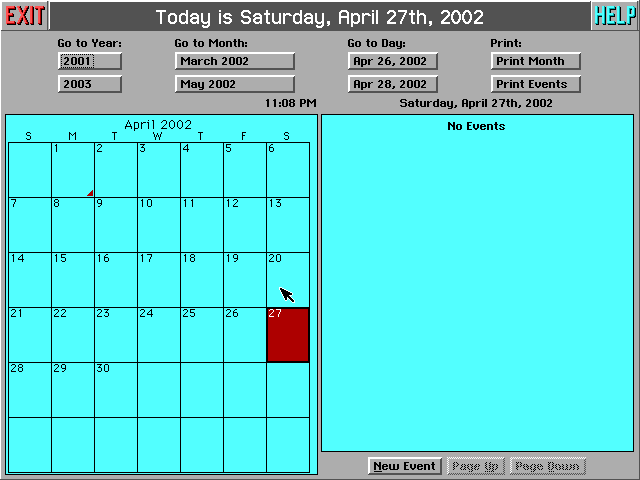 The applications run from here are the same as the advanced mode (they have menus and other advanced features), but they open up maximized to fill the screen. Advanced mode starts off with the GeoManager. At first it looks like the File Cabinet utility, but it can do much more. In this mode applications are opened in windows that can be resized or minimized to an icon. 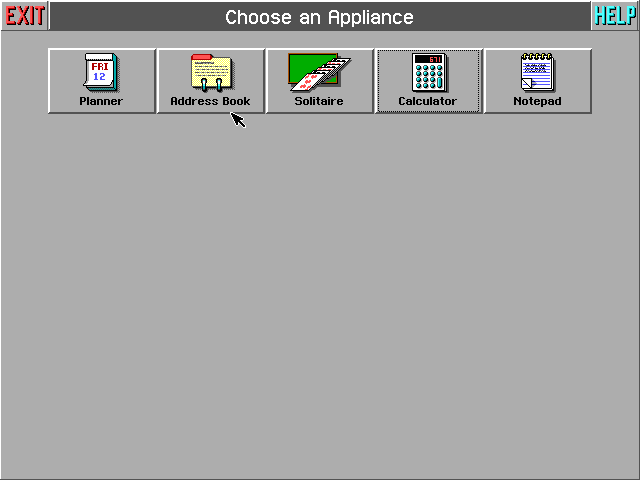 Advanced versions of the programs have drop-down menus that can be detached. Menus can be made to float in their own window by clicking on the thumbtack item. 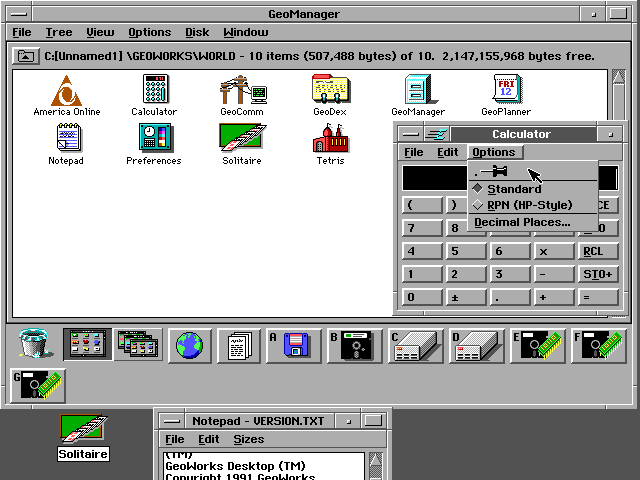 This version of GeoWorks comes bundled with America Online Version 1.2 and its icon is prominently displayed in the GeoManager window. I guess Bill Gates wasn't the first one to place advertising on the desktop!